By the snippet I pasted in, my title might seem surprising. You might expect my title to be, ‘Ungrateful Toward Veterans.’ In some cases (though very few) injured veterans miss out on the medical care and financial aid they deserve. But some government program or other comes to the rescue to relieve the wants of afflicted citizens in Canada. This major, however, did not miss out. He received a quarter of a million dollars for his trouble, and gets 75% of his salary until he is rehabilitated to the point of being able to make it on ‘civy street.’ I like the policy of monthly pension for life. But this New Veteran’s Charter seems pretty liberal. The remuneration the major got is a munificent emolument! It is so generous as to be nearly excessive! Yet he has the nerve to say, ‘Show me the money.’ How much would be enough for this ungrateful soldier? No amount of money would satisfy this guy! 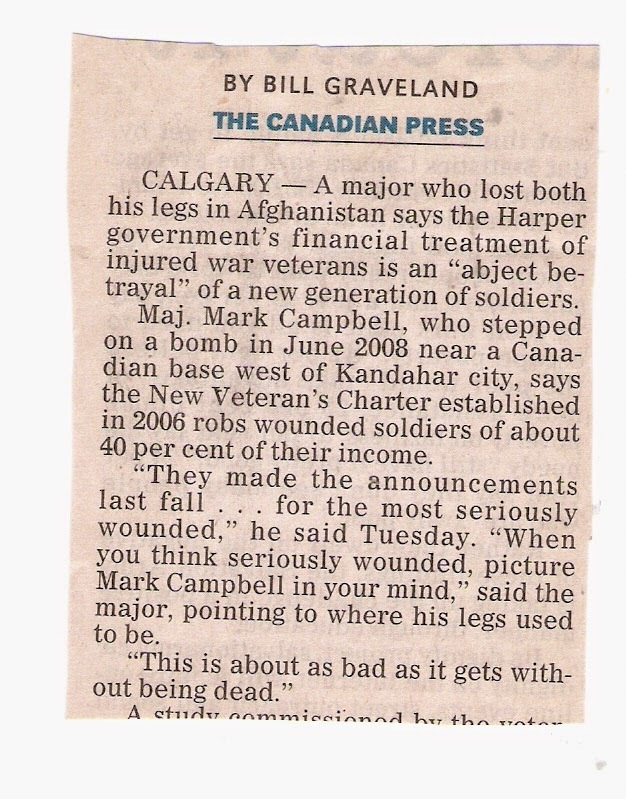 We should be grateful to injured veterans. But they should be grateful right back when generous compensations are handed out. Let’s suppose that the major, or some other soldier, is so injured that he can never get back to work. Then, in addition to his quarter million or so, he would get about $2000.00 per month plus 75% of his salary for life. Who would kick and balk at such lavish recompense?! This major would, and did. The man is a disgrace to the uniform and badge I used to wear myself! What should the man be given? A castle? A yacht? An island of his own? Bags of gold are not enough? What could this major want to do in life that even more money than he will get is demanded by him? “Hast thou found honey? eat so much as is sufficient for thee, lest thou be filled therewith, and vomit it” (Proverbs 25.16.) With the money that the major says is not enough, he could take a trip to an exotic place every month of the year, and do nothing the rest of the time but sip cocktails and get fat! Yet he calls the payment plan that could fund such a lifestyle an ‘abject betrayal’ and ‘grotesque travesty’! What will he do with the money he has already been given? Is it wise to give a large lump sum to someone with PTSD? The article I clipped the snippet from comes with a picture of this major in his wheelchair. Some role model! Not because he is in a wheelchair do I say so, but because of the dejected, pouting, poor-me look about this man who’s been so hugely rewarded! Steady up, Major! Come to attention! You make the soldiers look bad! The sulking discontent on your face is a poor piece of press for the PPCLI! You are not an infantry soldier to look up to because ingratitude and greed must be looked down upon! Where is your sense of dignity, man? Ingratitude and dignity are hardly found together! To give someone a dressing-down, in military lingo, is to jack him up. I have just jacked-up a major. That is a tall order for a low ranking private like myself to do. So I will call in some air support from the holy ether of heaven.